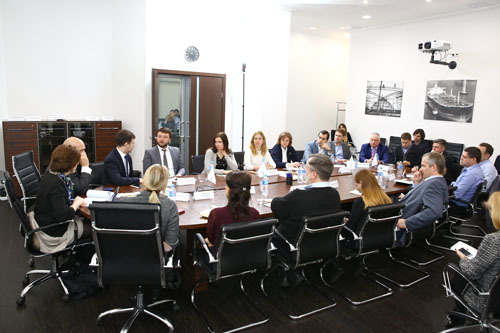 USRBC held a members-only presentation at the Agency for Strategic Initiatives (ASI) in Moscow on ASI’s Fund for the Support of Social Projects. The Fund was set up in July 2017 to support professional training, project financing (including co-financing with private companies), and the formation of an investment community dedicated to social projects. Building upon USRBC’s previous work related to increasing awareness of USRBC member company work on CSR in Russia and in identifying CSR opportunities in Russia for USRBC members, this event provided USRBC members an opportunity to learn about ASI’s activities, to explore best practices, and to multiply efforts for maximal impact. ASI’s Fund for the Support of Social Projects CEO, Evgenia Shokhina, briefed USRBC members on the work of the Fund, including information regarding a pilot project on vocational education that may be of particular interest. Evgenia Shokhina became the CEO of the Fund for Support of Social Projects in 2017 after serving for two years as Deputy Head of the Russian federal government’s representative office in Tula Region. She is also the President of the Business School of the Russian Union of Industrialists and Entrepreneurs (RSPP), a position she has held since 2013, and has worked as the Editor of RSPP’s Business Russia magazine since 2010. Ms. Shokhina headed RSPP’s Center for Management of Corporate Events from 2007 to 2011. She holds a degree in Political Science from the Higher School of Economics and an M.B.A. from the Institute of Communication Management.